doug: Upcoming events: beach volleyball, outrageous trick pool and more. Upcoming events: beach volleyball, outrageous trick pool and more. Why wait till summer for beach volleyball? The Centre for Campus Life is hosting a 3-on-3 volleyball tournament on March 31 at the Town Centre Park Volleyball Courts (across from the David Lam Campus in Coquitlam). All are welcome! Register online, or contact Scott Fraser-Dauphinee at dauphinees@douglas.bc.ca for more info. 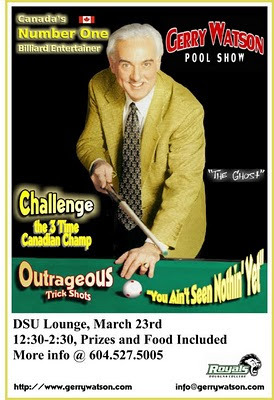 Come see Canada's #1 billiard entertainer in action, challenge the 3-time Canadian champ and have your mind blown by outrageous trick shots. March 23, 12:30-2:30pm in the DSU Upper Lounge - free food included! No registration required. Check out Gerry Watson's website or call 604-527-5005 for more info. You won't want to miss the biggest REC event of the year! 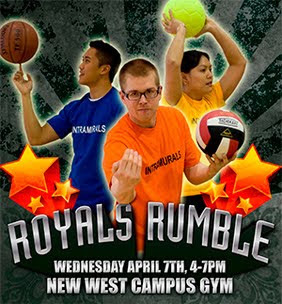 For 3 hours of mayhem on April 7th, your team of 7-10 students or staff will be in for an afternoon of sports that you won't forget. Teams will play a mini-tournament in 3 sports (basketball, volleyball, Indoor Soccer) and the best overall team will have bragging rights until next year. Great prizes for the winners and best team outfits will be awarded. Register online or contact Khalid Ahmed at ahmedk@douglas.bc.ca for more info.